Growing flowering vines like Canary Creeper is an easy way to add both height and texture to your garden. While it's worth growing canary creeper for its beauty alone, it also has the bonus of edible flowers. Sometimes, it's very easy to see how a plant got its common name. 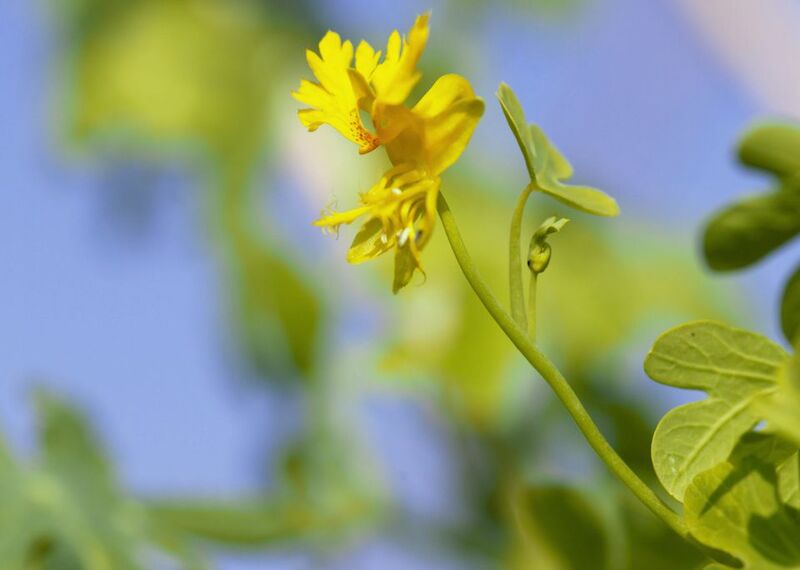 While the Canary Creeper has yellow flowers that resemble a canary's feathered wings, the real reason for its name is that Canary Creeper was discovered growing in the Canary Islands. The vine itself is rather delicate and doesn't reach great heights, but it clings easily and makes a nice, unusual climber in a garden. Canary Creeper is related to nasturtiums, which also have brightly colored flowers. Like nasturtiums, the flowers, leaves, and seeds are all edible, with a lively, tangy flavor. Flowers: 1 to 1 1/2 inch flowers are bright yellow with slight touches of red near their centers. They have 2 "ruffled" petals over 3 smaller petals. Leaves: Bright green, deeply lobed, delicate leaves. Canary Creeper is only hardy in USDA Hardiness Zones 9 and higher. Don't let that stop you from growing it as an annual vine. You will get blooms until the first frost. Plant in full sun, for the most flowers. In warmer areas, the plants should also do well in partial shade. The vines can grow anywhere from 4 to 10 ft. (h) by 12 to 24 in. (w) The size of the vine will depend on the growing conditions. Canary Creeper prefers warm temperatures and warm climates will provide a longer growing season. Expect your canary creeper vines to start blooming in mid-summer and continue on through fall. They are frost tender and will slow down as the weather cools. Canary creeper is such a delicate looking vine and flower that you usually see it growing by itself, on trellises. It climbs best on thin structures that it can easily wrap around. You could even use string to train it along a railing or porch. Even though the yellow flowers are bright, they can fade at a distance. Growing them near complementary colors like blues, purples, and deep reds will provide a background to highlight them. Soil: Canary Creeper likes a neutral to slightly acidic soil pH between 6.1 and 7.2. It does not need a rich soil, although some organic matter will keep it growing and blooming without additional fertilizer. Planting: Canary Creeper is usually grown from seed. As with most vines, it's hard to keep them from getting tangled with other plants, so nurseries don't tend to carry them. The seeds have a hard shell and benefit from scarification before planting. The easiest method is to soak them overnight. If you're really ambitious, you can rub them gently with some sandpaper and then soak them overnight. Seeds should germinate within 10 days. Plant the seeds about 1/4 inch deep. You can direct sow or start them indoors, about 6 to 8 weeks before your last frost date. Give the young plants a regular weekly watering of at least 1 to 2 inches, while getting established. Once they take off, you can slowly return to watering them regularly, and they should become quite drought tolerant. If direct sown, thin seedlings to about 1 foot apart, when they are 4 to 5 inches tall. Plants started indoors will bloom earlier, but if you have a long growing season, they may give out in mid-summer. To hedge your bets, starting a few plants indoors and direct seeding when you transplant will give you the best of both. Canary Creeper does best when the soil is a little dry and not too rich. Water only when the soil has had time to completely dry out, and don't bother with any fertilizer unless the leaves start to look yellow. Too much fertilizer will mean fewer flowers. There is no need to deadhead the flowers or trim the vines. Just enjoy. Few pests bother Canary Creeper. Aphids can sometimes be a problem. If you notice them, hose them off or use insecticidal soap.